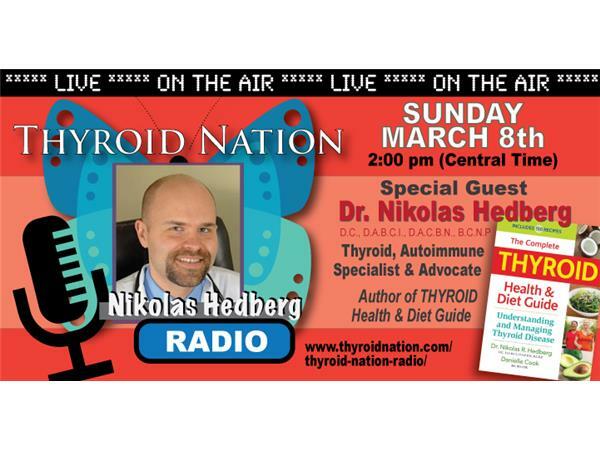 Hypothyroidism and Hashimoto's Disease Thyroid Nation Radio Interview - Dr. Nikolas Hedberg, D.C.
Diana : Hi everybody! Welcome to the third week, episode three, of Thyroid Nation Radio Talk Show Live and Podcast. I’m Diana Bowman, founder of thyroidnation.com. Tiffany: And I’m Tiffany Mladinich of gratefulgarden.biz. Diana: Also known as Diana and Tiffany, bringing you the voices of thyroid advocates, clinicians, bloggers and thyroid thrivers everywhere. In just a few minutes, we’ll be talking live with Dr. Nikolas Hedberg . I know that, I for one, am really excited. We’ve had kind of a working relationship, Dr. Hedberg and I, over the last, I don’t know, seven or eight months. I have lots of articles of his on my site, which are fabulous. Tiffany, I’m excited. Are you excited? Tiffany: Yes, I am. I, for one, appreciate Dr. Hedberg’s thorough and very easy to understand approach in his articles, and love the fact that he was drawn to functional medicine model because it leaves no stone upturned. Which so many of us need because there’s so many different reasons, problems, and approaches, that no one should be treated as a lab test or in a cookie cutter kind of way. So really, really just so excited to talk to him. 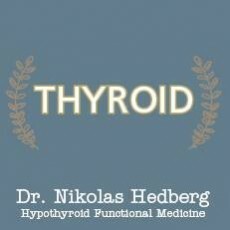 I love the fact that he offers his free Thyroid Ear course through his website, drhedberg.com. So it’s amazing and I’m just so excited to talk to him. I truly enjoy reading his articles. They’re very easy to understand and it doesn’t surprise me at all that he’s a regular speaker at integrative medicine conferences, and is also a consultant for other practitioners on very difficult cases. I’m excited to hear from him today. Diana: Yeah, me too. I’m really excited. Tiffany: I know you’ve got some exciting news, Diana, that you want to share with everyone first. Diana: Yeah. Yeah, absolutely. If you guys tuned in last week, which I hope you did, you know we were talking to the fabulous Isabella Wentz . If you missed it, though, you can always go back to Blog Talk Radio or the Thyroid Nation Radio page, and scroll down and you can find it there and listen to it, because it was wonderful and she was fabulous. Also, she talked about an anti-inflammatory green smoothie on the show, and I went and I put it back in the notes on the Blog Talk Radio page. So if you feel like it and want to see that, you can log into Blog Talk Radio, find Thyroid Nation, follow us, and in the notes, you’ll see the wonderful recipe that I put on there from Isabella. Also, we celebrated our one year anniversary on the 22nd of February, which we never mentioned on the first show, which is why we chose that day, and we gave away great prizes. We had like $1,700 worth of prizes and we drew the names, 42 lucky winners. We’re right in the process of collecting their email addresses and their mailing addresses and things. So they should be getting those and hopefully they’ll take pictures and send them in. I think that’d be kind of cool to share, don’t you? Tiffany: Yeah, I do. I think that’s very cool. We also want to thank our amazing Thyroid Nation Radio team of advisors, without whom this show would not be possible. They do so many amazing things behind the scenes that most people don’t know, so very, very special thank you to Raina Kranz, Laura Scheunemann, Melissa Phipps, Blythe Clifford, Penny Jensen, Sarah Downing and Marissa Ravelo. You can read about all these amazing women and their thyroid survivor stories on the Thyroid Nation Radio website. Very cool, and thank you so much to all you ladies. Diana: Amen. You really don’t realize what goes on behind the scenes and even to put on a show like this, so we’re really thankful to have them. Plus, they’re there for support. As a thyroid patient, you, me, everybody out there listening, that’s what all this is about, and the support they offer. They’re so positive. They share and they’re trying to spread the message. Kind of like my husband mentioned, you know, posting the links and the pictures and things, it’s how we find you guys. It’s not like we’re doing a TV commercial, so it’s how we find you guys. They help post in all the different groups, Facebook and things. The support is just wonderful. So we couldn’t do it without them. What’s really cool is there’s so many of them that if one’s busy, or three or four of them are busy, and they can’t help us one weekend, then the other ones can. So it’s really grand and we thank them all for what they do behind the scenes. Surely, you’ll hear from some of them coming up as co-hosts, so that would be cool. Okay. Let’s get this Thyroid Nation thriving. Today, our guest, hopefully he’s on the phone. Diana: He’s a board certified naturopathic physician. His name is Dr. Nikolas Hedberg. Among many of his credentials, he is a board certified nutritionist and chiropractic internist. He is the founder of the Immune Restoration Center in Asheville, Carolina – where some of my great friends live – where he helps people from all around the world suffering with a variety of chronic illness, including autoimmune and thyroid disorders. Welcome! Tiffany: Hi, Dr. Hedberg. Thank you so much for joining us. Can you hear us all right? Dr. Hedberg: Hi, Diana. Hi, Tiffany. Thanks for having me. Tiffany: Hi, how are ya! Dr. Hedberg: Great, great. It’s a beautiful day in the mountains, mid 60s. It’s been pretty cold here lately, so everybody’s out and about today. Diana: I bet they are. Because I have some friends – I think I mentioned to you in an email – that we met here in Costa Rica. We didn’t know them before that and they wanted to move back to be closer to family. They chose Asheville for some of the schools that are there. They sent us a little video yesterday, or the day before, of them snowboarding in their backyard! So if it’s 60 and sunny, a couple days ago they were snowboarding in their backyard, so I bet everybody is out and enjoying the day. Right? Dr. Hedberg: Exactly. Yeah, it’s really beautiful here in the spring, in the mountains. My wife and I, we’re not really big fans of the winter. Diana: Well, you’re not snowboarding. Dr. Hedberg: Yeah. No, not snowboarding. And you guys . Tiffany: What do you do for fun, Dr. Hedberg? We wanna know. We wanna know the real you. Tell us something. Dr. Hedberg: I like camping, hiking around here. I’m actually a pretty big computer geek, so I teach myself computer programming. I taught myself how to build computers. So I do a lot of that stuff on the side, a lot of tinkering, a lot of programming and stuff like that. Obviously, I spend a lot of time reading health books, research, and stuff like that. Diana: Yeah, your articles are really wonderful, and I really appreciate you sharing them and letting me share them with the world on Thyroid Nation. Tiffany: They’re so thorough! Totally! Dr. Hedberg: Yeah, I mean there’s so much information out there on the internet. It’s kind of hard to wade through it all. Tiffany: And so much of it is not true, or doesn’t apply, or has special circumstances per person, right? Dr. Hedberg: Right. The other thing that you’ll find on the internet is these black-and-white type statements. You know, like, Synthroid is bad. It’s bad for everybody, which is clearly not true. So you’ll have a lot of out there. Tiffany: I love this man already! Diana: Yeah, really, we love you already. That’s what Thyroid Nation is about. I know you know, Dr. Hedberg, but really, it is. It’s about there’s not just one answer. There isn’t. Diana: No, because everybody’s different. We’re all made different, right? So you were interested in medicine from a young age. Tell us a little bit about how you got started and just a little bit about you, before we get into all these wonderful questions we have here. Tiffany: And about your book coming up, so we wanna hear about that too. Dr. Hedberg: I was about five or six when I really wanted to become a doctor. I was watching Little House On The Prairie. I don’t know if you remember that show. Tiffany: Of course, we do. Dr. Hedberg: So you guys probably remember Dr. Baker, who was the small town physician who took care of everyone. I remember being five, watching that, and I just thought, “That’s really what I want to do,” and it just stuck from there. I even started reading health books when I was in elementary school, and did book reports on vitamin books and things like that when I was in middle school and high school. It’s a real interest in health and helping people since I was a little kid. I got my undergraduate in exercise science. I was a bodybuilder for years when I was in college. So I studied a lot of nutrition, exercise, and then went down the road that I did, into functional medicine, naturopathic medicine. Getting involved in thyroid is really just a result of seeing so many people who were on it, had thyroid problems. They were taking thyroid medication and it just wasn’t working. I would do these health lectures around Asheville, and whenever I would give one on thyroid disorders, it was always packed. You know, standing room only. Whereas if I did one on, say, allergies or gluten or you name it, the crowds were always somewhat moderate. But thyroid, it was just a packed house because so many people with thyroid problems and they’re just not getting the answers they need from conventional medicine. Diana: It’s crazy, isn’t it? You know, it’s funny that you mention bodybuilding because some of the best, most intricate articles that I’ve read on the thyroid have actually been on bodybuilding sites. It’s where you’re like, “that is so intensive.” It’s fascinating to me that some of the best articles I’ve read have been by bodybuilders. Tiffany: Well, let me throw in real quick, Dr. Hedberg, that one of my best friends from Texas, she’s a physique competitor. So it’s not complete bodybuilding, but it’s in the same area. She works out with bodybuilders and her trainer is a body builder and all of that. I just want to mention this because it’s kind of a question I have and something I’ve learned or may have noticed myself. She has started to recently feel like maybe she’s getting adrenal fatigue. She said that lots of her friends have. Well, I guess my question’s two fold. So talk about that a little bit. Also, what my first thought was when you said that you were a bodybuilder, I was thinking, “Okay, so what he might’ve taken, as far as supplements, and what he might have done back then, I wonder if he would do those same things now, knowing what he knows.” So that’s kind of two things to talk about real quick. Diana: And that brings us to a great first question. And then people start to develop hypothyroid symptoms just from over training and exercising too much. I’ll see a lot of these people. They come in their 40s and even in their 50s who. They’ve been eating really, really well. They’ve been exercising like they should, but it’s just too much and finally they just start to break down. Tiffany: Isn’t that amazing? I have to say it’s amazing. I don’t want to make a blanket statement and just say this next thing, but I’m gonna say it in hopes that you’ll get what I mean. Maybe we should have balance, as opposed to just going straight out and being a bodybuilder, you know? If you’re gonna do that, great. But maybe you should spend an hour meditating every day too, then. Or you do something to offset that. They’re healthy. These people are healthy. I mean, like you said, they’re eating well. They’re exercising. They’re doing all the things that you’re supposed to do, but they’re not finding maybe the connection to the Earth, or to people, right? Because everybody’s pushing. Even some of my family members used to be really into exercising, exercising, exercising, and that was their relief, but they weren’t finding the balance along with it. That’s probably why. It just floors me. Diana: So many times in that health arena, people do low fat and things like that, too, which just compounds the problem at the same time. Dr. Hedberg: Right. I mean, every day, our bodies go through a certain amount of wear and tear. It’s up to our immune systems to repair all that damage. When the immune system can no longer keep up with the daily wear and tear, no matter what it’s from and what’s causing it – whether it’s an infection, or poor diet or stress – when the body can’t keep up anymore, then the immune system just can’t repair itself anymore. Things start to break down and then people develop autoimmune diseases, chronic fatigue, thyroid problems, etc, etc. Diana: So let me give you an example, Dr. Hedberg. We have some great topics to cover today with you, that I really, really wanna make sure we cover it all, because I love your approach on things. So let me ask you a question, a more direct question. When you have a patient that presents to you with adrenal function and obviously, I’m assuming that your first thought goes thyroid as well, even though it may not necessarily be Hashimoto’s or something extra to that. So tell us a little bit about how you approach someone with adrenal function that has a thyroid function problem. Do you treat the adrenal problem first? What is your general protocol that goes forward with someone like that? Dr. Hedberg: Right. So when we’re talking about adrenals, adrenals are going to be more of a secondary or what we’ll call a tertiary issue, meaning that it’s usually not the primary issue. Basically, we’re going to look at all the possible causes that could be stressing the adrenals. I mean, I talk to patients just as much about their lifestyles, their purpose in life, their jobs – Do they like it? Are they in a healthy relationship? -just as much as I do their nutrition, their supplementation and things like that. For example, if we find someone who, let’s say, she hates her job and she has an abusive boss. She’s in a really bad marriage and she’s under a ton of stress. Then those are some of the things that I might have to lay down in the beginning about, “Well, you can try this diet and you can try these supplements and you can do all that, but that’s not really going to get to the underlying problem, which is clearly what I mentioned before. Diana: No amount of thyroid medication and supplements, yeah. Dr. Hedberg: Yeah. I mean, you’ll find a lot of functional medicine practitioners who will jump right to the testing, the supplements, medication, and things like that, when a lot of times, there’s just one major, core lifestyle thing going on that you just have to address at the same time. Then the other thing is salivary, cortisol, and adrenal testing is really popular out there, but it’s really not the best way to evaluate adrenal function. The best way to really do that is through what we call a 24-hour urine or a urinary spot testing, which I prefer. That’s four or five urine samples done over a 24-hour period. So you also get to see the cortisol rhythm like you would in the salivary panel, but the important thing to look at is how the the body’s actually metabolizing the cortisol. So for example, if you look on the salivary/cortisol profile, the only thing you’re seeing is the free cortisol levels in the saliva at that time, at four different samples. What you don’t see is how the body is metabolizing the cortisol into all the cortisol metabolites. That can give you some clues, especially with the thyroid. So if we see normal free cortisol, but we see very low metabolized cortisol, that’s a strong sign of hypothyroidism. That’s just something you don’t get to see on a salivary panel. So you asked, “what do you treat first, the thyroid or the adrenals?” A lot of that depends on what we see on the cortisol panels and how the body is actually metabolizing the cortisol, for example. So there’s a lot of different patterns there that we’ll look at, that can give us a much better answer as to what we may treat first. Does that make sense? Tiffany: Very much so, and you never hear about urinary cortisol, do you, Diana? Tiffany: I mean, you hear about serum. You hear about salivary. You hear about 24-hour, whether you do either, but you rarely, if ever, hear about urinary cortisol levels. That’s cool. Diana: That’s interesting. A little bit about me – I don’t know if you know this or not, Dr. Hedberg – but when I was diagnosed here in Costa Rica, they diagnosed me with Hashimoto’s, which was a little surprising for me because after I finally researched, I realized that a lot of people aren’t getting the diagnosis they need right away. I actually did, so that was kind of nice. I went to this doctor, special doctor, two hours away. It was the day before I was leaving for my Zumba instructor convention and he did not mention autoimmune, or lifestyle, or anything like that. That was not his training, evidently. So I’m thankful for people like you, because I’m getting a little bit of both. He missed that boat. He missed that part of what I really needed. So I left the next day and over the next year, I continued to be a Zumba instructor. My body, I had to take it upon myself to realize, like you said, what is the main thing? For the person, the woman you described earlier, it was her boss and her job. For me, I believe it was my Zumba, and that’s terrible because I loved it. That’s why it was hard for me and probably why I kept going for so long, because it really help me going mentally and I loved it so much. It just wasn’t right for my body. Now, that doesn’t mean that I”m never gonna go back to teaching it and that my body can’t recover. I love it so much and it’s so much fun, but that’s exactly it. That was my one thing and it never got addressed except for by me. I just said, “I’ve gotta stop this. I love it so much, but I’ve just gotta stop for awhile.” So I gave it up three or four months ago and my body is slowly coming out of it. So interesting. I never had the urine cortisol test. When I go back to the States, I’d like to do that. So that’s good to hear you say that. Tiffany: Let me ask you another question. This kind of ties us into another topic that you wanted to discuss, which is an amazing topic. So there are people that can have adrenal problems that inadvertently affect the thyroid. That doesn’t necessarily mean they need thyroid medication, does it, Dr. Hedberd? It means that you would then address the adrenals first, and then the thyroid would normalize when that was corrected. Right? Dr. Hedberg: Yeah. Those particular scenarios, that can happen. Like I said earlier, if the adrenals are effecting the thyroid, then there’s usually something underlying the adrenal imbalance. We’re probably investigating the underlying cause of the adrenal imbalance and addressing the adrenals at the same time. For example, cortisol levels will elevate and that can suppress the conversion of T4 to T3. It can effect T3 receptors and then it can increase reverse T3. Then it’ll also suppress the interior pituitary where TSH is made, so you can actually get kind of a paradoxical pattern of high cortisol, normal or low TSH, and then you’ll see low T3 or high reverse T3. So the TSH might actually look pretty good. Tiffany: And those people are going to do very poorly on T4 only medication, correct? The T4 actually compounds the problem? Dr. Hedberg: Yeah. In some cases, I’ll see a lot of people, they say, “Well, I took Synthroid,” or even if they took Armour or Nature-Throid or anything that has T4 and they just feel worse on it. Nobody has really explained to them why that’s happening. That can be one of the patterns as to why they feel worse. Tiffany: And also, it’s very indicative of how the physician or the practitioner is going to address what type of medication that’s used on the person too. That kills me, is that western medicine rarely tests for that reverse T3 or test those particular problems, but yet they choose to put someone directly on one particular medication that can make a lot of people feel much worse. Dr. Hedberg: Right, and there’s so many different patterns and presentations that would effect what you would choose to use. So for example, if it’s a patient who just can’t really tolerate T4 because of the adrenal imbalances, then that may be someone who just does better on T3 for a month or two to bring down the reverse-T3 while we’re working on the other things. You know, whether it’s in the adrenals, stress, infections, and things like that. Sometimes the best treatment is going to be different, depending on where the treatment is. So maybe they’re better starting off on T3, but maybe in the long run, after a few months on T3, maybe they’d be better on T4, or maybe a combination. It really just depends on the person. Tiffany: Thank you for hitting one of the most important topics, I think, that we could ever cover, is reevaluation of individuals when their diet changes, when their adrenals heal. It’s not a one pill and they’re done. So many people become over medicated when certain parts of the body heal, but yet, it doesn’t get addressed for too long, and they’re over medicated, feeling poorly, because the body is actually healing in one respect. It needs continual evaluation. Dr. Hedberg: Yeah. Then the other difficult thing is the individual, depending on their mindset or what they’re looking for. So for example, there’s gonna be individuals who that’s really all they’re expecting, is just to change the medication or change my dose or change the pill. That’s all they wanna do, is change the pill. That can become an issue as well, because you’ve gotta do the work to get well. Diana: Some people don’t wanna do that, right? Some people just want the one pill and they don’t want the revaluation. They don’t want that. So it leaves it a little bit like you said, Tiffany, maybe we’ve gotta keep spreading the message and letting people know it’s part of it. There is no one and done. Tiffany: You have to continually take an evaluation with yourself, as a patient. Tiffany: Even outside of your practitioner, you have to continually evaluate your lifestyle, your food intake, your stress. Everything effects, particularly people with Hashimoto’s. Okay. So another great, great question, which is kind of another thing that rarely gets discussed. It’s a frustrating topic for me personally because I think sometimes it makes people’s treatment much harder. 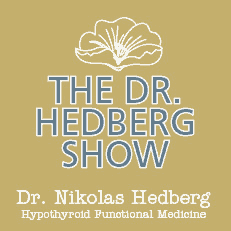 How does hormone replacement effect thyroid function, Dr. Hedberg? Dr. Hedberg: Right, so let’s go over just some basics there. Let’s begin with progesterone. Progesterone will increase thyroid function. Mainly, you’ll see increases in T4. You’ll see that when a woman is cycling during the second half of the cycle, which is the luteal phase. So the luteinizing hormone is made by the pituitary that signals the ovary to make progesterone, and then that’s one of the reasons why some women will notice a change in their body temperature, or they’ll get hotter during the second half or the end of the second half of the cycle. So let’s say we have a post menopausal woman and it appears she has possibly a sub-clinical hyporthyroidism, but nothing really major on the lab tests or anything else. But obviously, her progesterone is low and so she’ll take progesterone that increases T4. Then she’ll start feeling a lot better in regards to more energy, getting warmer, less constipation and things like that. So a lot of women will get a nice boost to their thyroids to just taking progesterone when they’re post-menopausal, and that’s one of the reasons why they feel so much better on it. Estrogen is interesting. Too much estrogen will inhibit thyroid function. Basically, what estrogen will do is it will increase the amount of thyroid binding proteins in the blood, and those will bind up the active thyroid hormone. So you can actually develop signs and symptoms of hypothyroidism because of too much estrogen. That could be either they were taking too much on a bioidentical or conventional hormone replacement therapy plan, or too many birth control pills. The more body fat you have, whether you’re man or a woman, the more estrogen you’re gonna have in your system. Then there could also be some genetic polymorphisms with estrogen metabolism. So the liver’s having a difficult time metabolizing the estrogen out of the body. Thyroid hormone is really important for estrogen metabolism, so it becomes a really vicious cycle. Testosterone is basically going to increase the uptake of T3 into the cell, and usually you can get women’s testosterone up just by having them do some weight lifting, 20 to 30 minutes a couple times a week, and increasing their protein. A lot of women are afraid of saturated fat, but you need some. So some high quality, like, grass fed butter and some stuff like that will kick that testosterone up as well. Because testosterone is pretty popular and a lot of practitioners are giving that to a lot of women, but there are other ways to increase testosterone without just taking it directly. So those are the big three. Tiffany: I was gonna say there’s some good sized drawbacks to testosterone right now, that are being explored, that I’ve been watching. That testosterone is not just you go for it kind of a deal. There can be some side effects and different long term problems from that at the same time. Tiffany: I’m sorry. I know you are so thorough. I just am chomping at the bit because I know so many of our listeners want to cover these topics that you chose. I know that you’re just gonna have so many teleconferences from this! We’re all like, “I want an appointment. I want an appointment.” So thorough. I mean in, what, ten minutes or twenty minutes, we’ve gotten more from you than many of us have gotten in 30 years from our doctors! Okay. Let’s stay on topic so we can really cover and make the most of your smarts, Dr. Hedberg. Is iodine safe and/or effective for Hashimoto’s and hyperthyroidism? Tell us how you feel about that. Dr. Hedberg: Right. We talked earlier about these extremists and these black and white issues where, you know, iodine’s great for everybody or iodine’s bad for everybody. So the first thing is we have to look at what does the peer reviewed medical literature say. I’ll let you in on a little secret: the whole high dose iodine movement that began in the early 21st century was actually based on a paper that was out of Japan that was misinterpreted, where the doctor that was promoting high doses of iodine who was also offering a supplement that had very high levels of iodine, misinterpreted this paper to say that, “Japanese mainlanders consume about 12 to 13 milligrams of iodine a day.” That’s actually not true. It’s actually more around 1.2 to 1.4 and that’s according to Nagasaki’s research out of Japan. So that’s kind of the first order of business. The second is that the research is plentiful in thyroiditis – whether it’s Hashimoto’s or Grave’s disease – that iodine increases lymphocytic infiltration into the thyroid gland, which increases inflammation in the gland, and so it is contraindicated in those cases. I’ve seen many, many, many patients come in who are taking iodine or high doses of iodine, and they really just feel so much worse taking the iodine. Now, if they have a non-autoimmune hypothyroidism and they have a true iodine deficiency, then yeah, iodine’s probably going to be great for them, just like with any other nutrient. That just kind of brings up another issue when it comes to supplementation, is it really depends on if there’s a deficiency. In industrialized nations, we’re just not really seeing nutrient deficiencies, despite all of the marketing that you’ll see all over the internet. Like, one of these things that’s going around is that you have to take all these supplements because our soil is deficient. I mean, people just aren’t really deficient in nutrients. Yes, sometimes that happens. Tiffany: It’s crazy. It’s so crazy. Dr. Hedberg: Yeah. Yeah, I mean, sometimes there are true deficiencies, and that’s a matter of we do a careful diet diary, diet history, look at if their diet is in fact low in iodine. Just a few other clues, if they are iodine deficient, is just going to be number one. Do they have uterine fibroids or fibrocystic breast disease? Which both can be a result of low iodine. Dr. Hedberg: Also, we look at estrogen metabolism. So I had mentioned urinary hormones before. We can see the metabolism of all three estrogens: estrone, estradiol, and estriol, and from that, we can determine, possibly, if the patient does in fact need iodine. Because iodine is really important for estrogen metabolism. So those are the main things that we we’ll think about, but it is certainly not a panacea for everybody. It should really be used cautiously if somebody has thyroiditis. Tiffany: One thing I wanted to mention too, about the topic of the Japan study, was a lot of that, even the dosage they was recommending was due to their over consumption of soy at the time. That was like in the early ’40s. So there were food things that were happening in Japan that aren’t happening here. Well, right now they might be, but getting also to the fact that iodine is important for people, even that do not have a thyroid, correct? Because of course, you have a lot of concentration of iodine in the breast tissue like you were mentioning. So it’s really important. Summing up my question – because God knows I could talk forever – 150 micrograms of iodine, which is the RDA recommendation, is that good for the general public or do you prefer testing? What testing do you prefer? So dosage, and what’s your preferred testing method? Dr. Hedberd: Yeah, so there aren’t really any good iodine tests. There’s the urine iodine spot test, which is not an accurate indicator of iodine status. There’s the iodine skin patch test, which is just completely useless. Over 90% of the iodine you put on your skin just evaporates into the air pretty quickly. That’s just not really a good test. Now, if you do a 24-hour urinary iodine test – and that’s without taking any iodine – that’s going to be the most accurate of any test. But usually just a really good patient history and diet review, we can tell if they may need some or not. So I like to use a product called Iosol , and it’s just a combination of iodine and iodide, sort of like a lugol solution. One drop has I think maybe 1.2 to 1.4 milligrams of iodine. If I think they are truly deficient, then we’ll use definitely no more than three drops a day for about three months, and then we’re done. I mean, they’re going to be completely saturated and fine. Then we just educate them on foods that are high in iodine, to incorporate into their diet to maintain it. What you said about 150 micrograms, that’s in a good multi. That’s usually enough to maintain it, but they can usually maintain iodine just through diet. One other thing to mention is that iodide is really the main source of iodine for the thyroid gland, and then iodine is really what saturates the other tissues, like the breast. So if you’re just taking potassium iodide or any iodide form, that’s really only going to impact the thyroid. So if you take a combination of something that also has iodine, you’ll get the benefits in the rest of the body, like the breasts, or in a man, in the prostate and things like that. Tiffany: Now, do you wanna touch on kelp at all? On what you feel about kelp as far as trying to correct an iodine deficiency? If you feel that that is beneficial or is it not something that you would recommend? Dr. Hedberg: So the most important thing with kelp is just making sure that the source is going to be very, very clean. I’m more interested in long term solutions, so we’ll just educate the patient on seaweed salad and other forms of food that have good iodine. So we may say, “Well, just have a seaweed salad once a week. It’s pretty high in iodine. Or incorporate some noni, or some of the other seaweeds that have a pretty good amount of iodine into the diet.” Kelp, like you said, it’s okay, just make sure it’s clean. Tiffany: Okay. Just a really quick tidbit on how do you approach iodine deficiencies and those three drops, you know, as you’re talking more, like, three milligrams of iodine. Do you approach that carefully with people with kidney issues? Dr. Hedberg: Yes. You have to look at the kidney just to make the filtration rate is okay, and make sure there’s no issues there. But it’s usually extreme well tolerated. I don’t use that much of it. Again, it’s mainly a focus on diet to get the iodine levels up. Tiffany: All right. So let’s bring us to another one of your great, very, very controversial topics and subjects. Do people need to worry about goitrogens? And we also want to address our readers out there, Dr. Hedberg, that have no thyroid. Do they need to worry about goitrogen? Dr. Hedberg: No. This is another thing that circulates around the internet about goitrogens, and you have a lot of extremists saying that if you have a thyroid problem, you should never ever eat goitrogenic food and things like that. Those studies are done on animals. You’re just not going to see any type of negative effect on thyroid function by someone who eats goitrogenic foods. They would have to be eating pounds, and pounds, and pounds of raw goitrogenic foods on a daily basis for it to begin to effect thyroid function. So it’s like you were mentioning before, it’s about balance. Tiffany: Right. Kind of a personal subject, again, can people with Hashimoto’s or people who are low in iodine levels, can they be sensitive to goitrogens? Dr. Hedberg: If they’re iodine deficient and they’re eating a lot of goitrogens, then yeah, that might have an effect on their thyroid function. But again, I would quickly pick that up just by looking at their diet diary. Tiffany: Okay. So bringing us to another: what are your best choices of thyroid medications today? Talk a little bit about the different choices that there are for different people and how those apply to your patients. Dr. Hedberg: Right. So the big ones are going to be Synthroid. That’s the brand name for levothyroxine, that’s just T4. So that’s going to work for a lot of people. And then you have the defecated forms: Amour Thyroid, the Nature-Throid, and the Westhroid. The Nature-Throid and the Westhroid are gonna be, I guess what we will call so-called cleaner, less allergenic sources, because Armour does have a few fillers. Those are gonna be a combination of T4 and T3. And then there’s just straight T3, which you can get compounded or you can just take in the form of Cytomel. So those are sort of the big three. There’s a new liquid T4 called Tirosint, which really improves the absorption of the T4. So there aren’t really as many restrictions on when or if you take it with food. So that’s becoming more and more popular. And so those are really the main ones and it’s just really a matter of finding the best one for the individual. Tiffany: I think even the studies have shown that gelatin can actually increase absorption. I’m waiting for the future of thyroid medications that are all done like that. That would be wonderful, and of course, when they drop in price. Unfortunately, Tirosint is very expensive right now. Tiffany: So another great topic you wanted to cover. Sorry. Go ahead. Dr. Hedberg: I was just gonna mention one other thing. It’s interesting because hypothyroidism results in hypochlorhydria. For the listeners out there, if they don’t know what it means, a very low stomach acid levels. So that will effect the digestion and absorption of pretty much everything. So you can see how that could be a problem if the patient has hypothyroidism. They have low stomach acid and then they’re not going to be absorbing their nutrition and their medications as well. Tiffany: Okay. Well, that’s good to know. Let’s move on. We have lots to get to. Can you tell us, Dr. Hedberg, why vitamin D may not be the best option for thyroid patients? However, there’s a few things to be aware of when it comes to hypothyroidism. What can happen is if someone has a chronic stealth infection – which I know we’ll talk a little bit about later – some of these infections, like the Epstein-Barr virus, can deactivate the vitamin D receptor. So if the infection is active and the vitamin D receptor is deactivated, where is the vitamin D gonna go? Well, now we know that vitamin D, the 125-hydroxy vitamin D, actually will bind to T3 receptors. It can basically lead to thyroid hormone resistance if they’re taking too much vitamin D and they have a chronic stealth infection. Some of the main ones are going to be Epstein-Barr virus, Lyme disease, and a few others. So that’s why you just have to be really careful if you’re gonna supplement a patient with a thyroid problem with Vitamin D, without evaluating them for chronic stealth infections. Tiffany: Diana and I talk so frequently about everybody being so different. You know, someone can have a yeast infection and adrenal problems, and be Hashimoto’s. Then you can have someone that has just adrenal problems. There’s never just one protocol that fits for everybody. It’s so tailored. Thyroid disorders are so tailored. So let me ask you another fairly controversial subject, because I know Western medicine argues this daily, and we have, evidently, a haunted mansion. Someone’s closing the door in the back there. I don’t know if anyone can hear it. Diana: That would be me. That is my son. I apologize. Diana: I’m just freaking out. He’s across the room and he’s lifting the door. It’s creaking and he keeps doing it. I’m waving, if you can imagine. Tiffany: I feel like I’m in a haunted mansion. Diana: Yeah! I’m trying to make him stop and my husband’s supposed to be watching the kids. Okay. Sorry. That was me. I’ve got the haunted mansion today. Okay, sorry for the break. I don’t know where we were at because I was waving and sweating over here. Go ahead. Don’t mind us. Tiffany: Sit down, woman! Okay, so our other controversial question that, like I said, Western medicine argues repeatedly. It drives me super crazy nuts. In your opinion, Dr. Hedberg, when is a gluten free diet the best option in thyroid disorders? 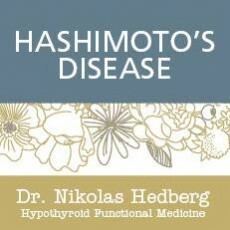 Dr. Hedberg: Yeah, really only in patients that have autoimmune thyroid disease like Hashimoto’s or Grave’s. This is another issue that’s just being blown way out of proportion. It’s made a black and white issue, like all gluten is bad, which is absolutely ridiculous. About 2% of the population has Celiac Disease and they need to stay away from gluten. But we know from the research out of Standford University and the FODMAP diet is that it’s not actually the gluten that’s causing problems in these people with so-called non-celiac gluten sensitivity or gluten intolerance. 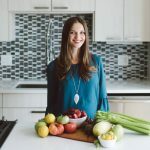 It’s the FODMAPs, which are compounds and foods, that effect digestion and the immune system in the gut, you know, where 70% of your immune system is. Pretty much almost all of the patients I’ve seen over the last three or four years, most of them, they’ve already been gluten free for at least a year, two years, even longer, and it’s done absolutely nothing. I say, “Well, why are you still eating gluten free if it hasn’t helped you at all?” They say, “Well, the other practitioner I saw was really adamant that I never eat gluten again.” So these are people who don’t have autoimmune thyroid, but if they do have Hashimoto’s and Grave’s, it does seem to irritate the autoimmunity. It’s really not a root cause, it’s just more of an irritant. It’s more of a problem around what I talked about before. It’s what we call allostatic load. I don’t know if anyone’s familiar with that term, but allostatic load is basically looking at the total amount of stress load on the system on a daily basis. Gluten just contributes to that allostatic load. It’s one piece of the pie, but it’s not like a cure-all or a major thing that everybody needs to be extreme about. Tiffany: Two points to just throw on top of that too is that going gluten free can actually increase nutrient deficiencies in some people. The other thing I wanted to mention is Hashimoto just went out Diana’s door. But it was important, so let’s all just give that a moment of silence. Kinda leading in, Diana, you wanna? Diana: No, wait. Wait, wait, wait. Tiffany: No. Yeah. Go ahead. Diana: Well, I was just gonna talk about the gluten for just a second. I want you to just recap a little bit about your stance on gluten because hopefully there’s a lot of people listening and we’re trying to spread the message for more people to get on and listen. Gluten is not a complete enemy is what you’re saying? I want to make sure I’m understanding. Dr. Hedberg: Yeah. This is the thing that needs to happen in alternative medicine, is things need to be qualified and quantified. So what is the quality of the source and the quantity of the source? So take, for example, I have a few studies on sourdough bread. Before quick rise yeast, pretty much all bread was sourdough. I have a study that I can send you guys. Patients, actually, with celiac disease were given a specially formulated sourdough bread. The sourdough leavening process, the microorganisms digest pretty much, not all, most of the gluten and it brings it down to a very, very low part per millian level. These patients with celiac disease were totally, 100% completely fine eating the sourdough bread. That’s why we have to qualify and quantify the statements. There’s a big difference between Wonder Bread – which isn’t even a food – versus a homemade heirloom, artisan, sourdough bread. We have a guy here in Asheville who has his own wheat field, gets his own seeds, grinds the wheat himself in the stone mill, puts it through a full sourdough process. There’s a big difference between what he makes and Wonder Bread. If people with celiac disease can eat sourdough bread, or really high quality type of sourdough bread, then a lot of people that think they have issues with gluten are completely fine. I do this with patients all the time. If you’re local, I’ll say, “try this bread,” and they eat it and they feel totally fine on it. But if they have a regular piece of whole wheat bread, they feel horrible. That’s because the quality is very, very different and plus the sourdough process. It really completely changes the amount of gluten and how the body digests it. Tiffany: I completely, totally, and thoroughly agree. Diana: Okay, so there’s gonna be two things that happen. There’s gonna be people moving to Asheville for this bread guy, and there’s gonna be some kind of increase in sourdough stock tomorrow. Tiffany: Put the head-bird in the bread. I’m coming. Diana: You know, there’s Dr. Hedberg in Asheville, my friend’s in Asheville, and there’s this really cool bread guy. I mean, what more do we need, right? Okay, well, let me ask you this, though. Tiffany: Diana? Can I throw in one quick? My Hashimoto moment came back and it is very important. Tiffany: Gluten free can sometimes be confused with insulin resistance, glucose intolerance and carb-loading, correct? The problem may be coming from those three topics, rather than the gluten per se itself. And then Diana you go ahead. Right, Dr. Hedberg? Dr. Hedberg: Yeah, that’s exactly right. Tiffany: Okay. You’re on, Diana. Diana: Well, why don’t you expand on that just a little bit? Why don’t you expand just a little bit, so that everybody else besides the two smarties on the phone can understand what you’re talking about? Dr. Hedberg: Well, the interesting thing is that whole wheat bread is actually fairly high-glycemic. A lot of people think that it’s moderate or low-glycemic, but a lot of it out there is high-glycemic. There could be issues with what the bread is made with, other ingredients in the bread, whether there’s eggs in it or dairy. Patients might have sensitivities to that. If a patient has a food sensitivity, whether it’s to wheat, or gluten, or anything else, that will have a stronger insulin response, higher blood sugar levels, and then that creates more inflammation. Then it’s just a downward spiral from there. So yeah, it depends on the source of the gluten, where it’s from, how much they’re eating. Blood sugar’s a big issue, especially in America today. Almost every patient I have, we have to spend a lot of time talking about blood sugar, low-glycemic carbohydrates, and making sure that they’re not doing anything that’s gonna spike their blood sugar. Tiffany: Right. So when someone eats the whole loaf of sourdough bread, they may have a problem that they may think is the gluten. It’s just the fact that they ate the whole loaf that’s more of the problem. Diana: You know, Dr. Hedberg, I have to tell you while we’re laughing there. Tiffany had herself a Hashimoment – I guess is what you wanna call it – and just a weak moment a week or so ago. Her husband was not very happy with her and her face just exploded. It looked terrible and it wasn’t only the gluten. So it wasn’t only the gluten. Tiffany: It was french fries. I have to tell for our listeners. I eat sourdough and only at one particular bakery. I do very well and everything is fine, but I had a very small slice of french bread. I’m very, very sensitive too. Of course, I’ve got kidney and glucose intolerance issues, and insulin resistance. My husband said, “Are you sure you want to eat that?” You know, I mean, this sucker was not more than two inches long and a three-quarter inch wide. I had made chicken noodle soup and it sounded good. The kids had it and blah, blah, blah. Anyway, he goes, “Are you sure you wanna do that?” I said, “Oh, yeah. It’ll be fine. It’s a small piece of bread.” He said, “All right,” and he walked away. I mean, 23 years we’ve been married. He’s no stranger to what happens. Anyways, I got my quick reminder that it’s not such a good idea. So Diana, she made me send her pictures because my face swelled up. Diana: Yeah, I have blackmail pictures to share with everybody later. So tune in later. Diana; I’m not. I’m not. I’m not. Okay, so moving right along. Let’s see. I’ve lost my place now. Sorry. Tiffany: How about leaky gut? Diana: Yeah. Leaky gut. That’s a great topic. Tiffany: So what is leaky gut? . Are there any strategies for healing it? Dr. Hedberg: Yeah. It is a recognized condition. In the literature, you have to do a search. It’s called gastrointestinal hyper-permeability. There’s a lot of research out there on it. The main things to think about with leaky gut is going to be, number one, the stress of the individual. Because high levels of cortisol will break down the gut lining. Other than stress, you have to look at food sensitivities. Are they eating a lot of things that could be stressing the immune system in the intestines? For example, we used to just eat food that were available seasonally and now we eat pretty much the same foods all the time, all year long, and that’s just not really the best thing for the immune system and the gut. It needs a break from the same thing over and over again. So we’ll see people that come in and they’ve been eating like a bowl of oatmeal every morning for like 35 years. Never missed a day because they read oatmeal was good for them, for example. So we have to make some changes there and get them eating something different, more variety. Then the third big thing is going to be infections in the GI tract. We’ll do a stool analysis to look for intestinal dysbiosis, bacterial infections, intestinal parasites, yeast and fungi, and things like that, which can break down the gut immune system as well. So those are the big three: the foods, the infections, and then the patient’s adrenal and stress levels. Then healing it isn’t that difficult. If the patient has removed the stress in their life that has contributed to the leaky gut, then it’s not that hard to turn around. A lot of times you can just do that through diet, and so we give patients a bone broth recipe. We do a few supplements, usually high doses of glutamine, about 20 to 30 grams a day for a short period of time, can patch up the gut pretty quickly. And then if they need it, some probiotics. So those are the big strategies. A lot of times, it’s more removal, like removing things, taking things away, than it is adding a bunch of things in. It can heal it quite nicely. Tiffany: Taking away what, for instance? Dr. Hedberg: What I mean by taking away is taking away the stress in their life, that’s breaking down the gut, or taking away food sensitives, or taking away an infection that might be there, like a yeast or a parasite. Tiffany: Okay. That brings us to our next great topic that you wanted to cover, Dr. Hedberg. We hope that you’re okay with going a little bit over the hour. You okay to stay with us for awhile? I mean, you know, a short while. We’re not going to keep you. Dr. Hedberg: Well, yeah. No, we’ll go as long as well need to. Tiffany: Awesome. So our next question is most effective supplements for those with Hashimoto’s and tying that into the digestive system. If you can answer how you might feel about colostrum and leaky gut, and then going into most effective supplements. Dr. Hedberg: Yeah. Specifically for Hashimoto’s, we’re looking at selenomethionine, which is really the preferred form of selenium. I wouldn’t use the selenocysteines or selenocyanates, too much of that can lead to diabetes and create insulin resistance. So selenomethionine, we’ll use anywhere from 200 to 600 micrograms a day. That’s been shown to bring down antibodies, and then it’s also going to be effective against the Epstein-Barr virus, which is very, very important in a lot of Hashimoto’s cases. If the vitamin D is actually low and they don’t have a chronic stealth infection, then Vitamin D, usually anywhere from 800 to 1,200 IU a day is going to be good for balancing the immune system. A few other ones that are good for balancing the immune system and Hashimoto’s are going to be reishi mushroom extract, that’s excellent. Curcumin, that’s going to be a great anti-inflammatory for Epstein-Barr virus as well. I know we’re going to talk about it here shortly, but a lot of times the best supplementation is going to be those that are targeting the underlying infection that’s driving the Hashimoto’s. You had asked about colostrum. Colostrum is a great supplement for enhancing the immune system in the gut. I don’t really use it in practice because there’s a lot of things to choose from, and we’re usually able to do well with the right probiotics for the gut and the immune system, and getting the patient eating the right way, the right diet, and things like that. Tiffany: Because I know there’s been a little bit of promotion and there have been studies, especially for people that were not breast fed initially, you know, that whole reparative and protective with colostrum. It’s a fairly controversial subject, but we had someone that was asking specifically about that. So we wanted to put that in there to get your thoughts on that. Dr. Hedberg: Yeah. I’ve seen a lot of patients who have tried it and it didn’t really help. Then I’ve seen patients who tried it and it did help. Again, it brings us back to what does the individual patient really need? Is colostrum going to be a supplement for everyone with Hashimoto’s? Obviously not, but the research is really strong on it. Now, I also use a lot of whey protein in my practice. So if there isn’t a dairy sensitivity, then whey is going to be excellent for gut health and immune system, and all that stuff. Diana: Okay. Those are all interesting things, you know. Like, not the norm that people talk about, so I’m glad you said all of those and people can go back and listen in case they missed all of it. But one of the ones that stood out for me is the reishi mushrooms. So that’s something that you are big on using in your practice, Dr. Hedberg, yeah? Dr. Hedberg: I use a lot of reishi and also cordyceps mushroom as well, great immune system modulators. Reishi contains compounds called triterpenes. Triterpenes have been shown to be highly effective against the Epstein-Barr virus. A lot of patients with Hashimoto’s have Hashimoto’s because of chronic Epstein-Barr virus activity, and so it works extremely well for controlling that viral infection. This brings us back to misinformation on the internet about whether you want to stimulate certain parts of the immune system, or if you need to be careful with that. That’s really not something that people need to be concerned about, because these mushrooms have other immune system modulators that will balance the immune system if the patient has Hashimoto’s. So you really don’t need to worry about making the autoimmunity worse by using mushrooms like reishies or cordyceps. Tiffany: Right. It’s a food-based rather than an herbal-based. I think a lot of people can get themselves into a bit more trouble when they’re dealing adrenal adaptogens. How do you feel about adrenal adaptogens? Dr. Hedberg: Yeah. You know, stress is such a big part of chronic illness, so most of my patients are going to be on some kind of adrenal adaptogen, for a variety of reasons. The ones I like are rhodiola, eleutherococcus , panax ginseng and ashwagandha. Those are my favorite four. They just have a lot of benefits like enhancing conversation of T4 into T3, though low or high cortisol, or increase cortisol in adrenal fatigue, good for the mood. Some of them enhance serotonin and dopamine, more stamina, more energy. If they have a chronic infection, those work well as sort of a so-called long term immune builder, where in the long run, we’re trying to strengthen the immune system over a long period of time. Those work extremely well in those cases. Diana: I wanna mention that when you say all of these – and for the people listening – it’s really individual, so you need to find a good doctor that knows about these adaptogens, and that can help you based on all of the things that are going on in your body. Because sometimes ashwagandha may be too much for someone and eleutherococcus may work for one and not for some. So it really just kind of depends. Is that not right? Dr. Hedberg: That’s exactly right. The internet’s a great thing because there’s a lot of information out there, but unfortunately, a lot of people try to treat themselves. They’ll read, “Well, this is good for this” and they have it, so they try it. They either get worse or it doesn’t help them at at all, for example. So yeah, it’s important to really understand this stuff. It’s important to not just take a shotgun approach. Like, if someone’s trying to treat themselves, they just try all these things instead of really trying to get precise and really identify the root cause of their illness. Diana: That’s perfect. We just had Isabella Wentz on last week and she’s the root cause queen. I totally agree with that, Dr. Hedberg. Just finding your root cause and it’s not easy. It takes time. I’m not there. I am so not completely well or not even close to being well. I haven’t identified everything that needs to be done for me. I’m still healing and I’m tired. I have to take naps, but I’m slowly getting better. I’m slowly learning. So you know, it’s just one of those things. But I want to ask you really quickly. On Thyroid Nation, that’s one of the things that I really wanted to do, is I wanted to provide what I felt was good, responsible information, but not one approach. I was hoping that everybody who read Thyroid Nation would take bits and pieces from it, learn their body, work with a doctor, and apply it in that manner as opposed to this way or the highway. Or, you know, I may post an article on gluten is the best way to go for our immune disease. You’ve just gotta take bits and pieces of that. You’ve gotta be smart because everything on the internet, you’re right, it’s not so black and white. So there’s that, first of all. There is no one approach that works for each individual person. We can’t say that enough. But the other thing I was gonna say is I know that I go on all these forums and all these groups. I have probably seen thousands of people say, “My antibodies came down because of gluten.” Can you just clarify or address that? Because we talked about gluten earlier and it’s not the end-all-be-all. It’s not the evil that everybody thinks it is, but I’ve seen lots of people who say, “Bottom line, my antibodies were 2,000. I stopped gluten, and they’re out.” Just to clear things up, will you address that a bit? Dr. Hedberg: Yeah, no doubt. Going gluten free has definitely saved lives. It’s completely reversed illnesses. Definitely a very, very important thing in certain individuals. What you don’t see on the forums is the thousands of people that have tried it and it didn’t do anything, for example. So again, it’s an individual thing. Especially with Hashimoto’s, Grave’s, autoimmune, thyroid disease, a lot of people are going to be helped by going gluten free, but also a lot of people won’t really notice a big change. And again, the other thing is so now that those thousands of people are better, going gluten free, what would happen if they had properly prepared, say, sourdough bread a few times a week or a few times a month? Or do they really need to be extreme in their diet and their restriction of gluten once they’re well? And the answer is maybe, maybe not. Again, depends on the individual. So maybe they go gluten free, their gut heals, their immune system balances. They’re healthy. They’re feeling great. Then, on a moderation-type basis, are they able to eat gluten if it’s properly prepared? And how much can they eat? Do they really need to be that extreme every day for the rest of their lives? The answer is, again, it depends on the individual. Because some people can eat it again if it’s in a high quality form and in the right quantity. Diana: And that’s that point Tiffany made, and we want to say – we can’t say it enough – is revaluation. Revaluation. Recheck your body. Check in daily. Daily check ins. Figure out what works for you and what doesn’t work for you. Tiffany said it earlier. I know you said it and I’m saying it. So we’re all saying it. You’ve just gotta keep going back, and you gotta keep checking things and seeing where you’re at, because it’s an ever-changing process. Once you’ve healed your gut, can you add that gluten? Maybe you can, so you just try. You just keep going. Which is hopeful for me and for my family. So that’s great. Diana: Okay, well, Dr. Hedberg, we have covered so much. If you can imagine, time’s almost done. So we want to thank you. You have been so wonderful. Tiffany: There is not enough time for you. Diana: No, no. You’ve been so wonderful. Tiffany: Not enough time. We could do a 24-hour retreat with Dr. Hedberg. I’m thinking we’ll have to do that. We’ll go to Asheville. That’s what I’m thinking. Diana: That’s right. That’s right. Tell your wife we’re going to steal you for a night. She better watch out. Dr. Hedberg: I like that idea. Diana: A bunch of women and Dr. Hedberg. How great! Yay! Tiffany: I know. Poor thing. Diana: But really, thank you. You’ve always been wonderful to me. I can’t thank you enough for coming on the show. He donated some of his books that are releasing in April, correct? Dr. Hedberg: Yeah. 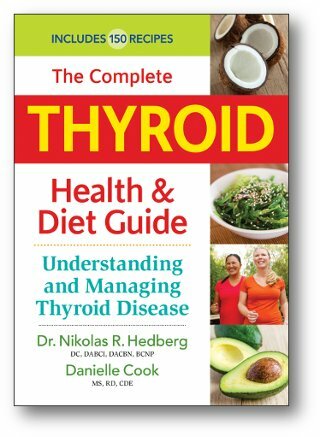 The new book is called The Complete Thyroid Health and Diet Guide. It’s available for preorder on Amazon. I think they just put a new release date up. I think it’s mid-April. They’re sending you some copies that I think you were gonna distribute that to some of the listeners. Diana: Yeah, absolutely! We’ve got some winners for that, so that’s pretty exciting. I’m excited to get my hands on a copy myself. I have a link for that on thyroidnation.com, on the radio page, so you guys can check it out and preorder it. The link is all there, so that’s good. But just thank you so much, Dr. Hedberg. Don’t forget about his e-course. He has a free e-course. How else can they find you? Why don’t you go ahead and tell us how all the listeners can find you, Dr. Hedberg? Dr. Hedberg: Drhedberg.com is my website and then you’ll see links on there to my different social media places like Facebook and Twitter. I usually post almost on a daily basis on those social media outlets. I have a lot of webinars and videos on Youtube, so those are some other good resources. Tiffany: Awesome webinars and videos. Dr. Hedberg: Yeah. I’m usually putting out regular information, always trying to stay up with the latest research, and put that out there. This year I’m really gonna be focusing on tackling some of the really popular, extreme topics that we talked about today and beyond. Just to try and settle everybody down, so to speak, and bring a sort of common sense approach to these things. I’ll be writing about genetically modified foods, gluten, and things like that, so it should be an interesting year. Tiffany: Dr. Hedberg, can I mention a couple things about you as well, for our listeners? Dr. Hedberg is a board certified naturopathic physician and board certified nutritionist. That’s something that you honestly really don’t see very often and it is so critical for thyroid patients, as well as anybody with autoimmune disorders and chronic illness. You also offer telemedicine through Skype or via the phone. So I really want to mention that to our listeners, because I know that so many people are just so impressed with how thorough you are and how well you explain everything, that people can go ahead and schedule a consult with you through your telemedicine. That way people throughout the world can receive your very unique and extraordinary care. I mean, I absolutely love your articles. I’m a big fan of yours, wanted to tell people that you do consultations over the phones. I just wanted to throw that in there. Sorry about that. Tiffany: I think it’s important for people to know that. That’s really important. Diana: Well, it is important, because there are some people in places who are always saying, “I need a functional medicine doctor. I need a doctor who’s going to listen, or I need a thorough doctor” or whatever. They can’t find one. So this is a very good option. You can definitely get in touch with Dr. Hedberg and he can help you, it sounds like. I may just call you up next week. Watch out, Dr. Hedberg. Dr. Hedberg: I’m on vacation this week. Diana: That’s right. No wonder. I was like, “He’s hesitating. Why is he hesitating?” I forgot. He’s on vacation, that’s right. Well, then we’re not going to take up any more of your time. It has been absolutely wonderful. Thank you very, very much and we’ll chat when you are back from your vacation, I hope. Dr. Hedberg: Yeah. I really appreciate you having me on. This has definitely been the most fun I’ve ever had on a radio show, so good job. Diana: Thank you. Thank you. Have a great, great day. Tiffany: Wait until we come to Asheville. Diana: That’s right. You’d better start preparing. Dr. Hedberg: Yeah. When you come to Asheville, look me up and we’ll hang out. Diana: We’re going to go take a tour of the bread guy’s place, so he’s gonna love us. Dr. Hedberg: Eat some sourdough bread. Diana: That’s right! That’s right! Okay, Dr. Hedberg, you have a fabulous day. Tiffany: Well, happy vacation to you, Dr. Hedberg. Diana: Yep. Thank you so much. Dr. Hedberg: All right. Thank you so much. Take care. Tiffany: Thank you. You, too. Diana: Talk to you later. Bye-bye. Dr. Hedberg: All right. Bye-bye. Tiffany: As well as Dr. Hedberg, we would like to thank our listeners. Tiffany: I know. He is so amazing, is he not? I’m telling you. I’m calling him. I’m serious. I’m going to Asheville and I’m going to hijack him for the weekend, too. I’m gonna pick you up first though. Diana: I know, I know. You just can’t call him next week. You just can’t call him next week. Did you hear him? He hesitated and I was thinking, “Well, why is he hesitating?” Well, he’s on vacation. I remember now. That’s right. So we’ll have to get his wife too. She can hang out with us. Surely, she loves to talk about thyroid and health. Poor thing. She probably hears about it all day long, right? We’re going to hijack him. We’re gonna hijack him, Mrs. Hedberg. Watch out. Yeah. Tiffany: We wanna thank our listeners, don’t we? Diana; Yes. Yes, thank you. Tiffany: And we have a very cool story about a special listener, so thank you so much everybody for taking your time out on a Sunday to hang out with crazy me and sassy Diana. Diana has a really cool story to share with you all about a listener last week. Diana: Yeah. Yeah. We had a listener last week. Her name is Susan Ship . I’m just going to go ahead and say it because she’s got her own blog with her name on it. It is ztozhyperthyroid.wordpress.com and she wrote a fabulous article, Hashimoto’s Negative Self Talk, and then talked about the radio show, and how it inspired her, how it helped her and how it helped her not feel alone. It was just the nicest article. I’m going to include it today, underneath Dr. Hedberg’s information, in case anyone wants to read it. It was so nice. It was so real. It was so thoughtful and it was so relevant. I mean, I read it and had tears. All the team read it and it was just amazing. Thank you, Susan. Maybe, I think she’s going to write her thyroid thriver story now. So we are going to have some thrivers on, coming up, so maybe we’ll get a chance to have her on the radio. But we just wanted to give her a shout out, tell her thank you, and send you guys to her. Tiffany: Thank you. Thank you. Diana; And send you guys to her blog. I’ll post the link too. So thank you. Tiffany: If any of you all out there have a thyroid thriver story, we would love to hear it. Diana and I would love to hear it, especially Diana, on Thyroid Nation. So you can help us raise awareness on all the different types of journeys and what have you, by submitting your story directly to the thyroidnation.com/thyroidthrivers/submityourstory. So even if you are not completely well yet, that is so important, because the journey is where we all learn what worked, what didn’t, how long it took you. We all just learn so much from these journeys. You may even get chosen to appear live on Thyroid Nation Radio and talk with me and Diana a bit. Don’t you think, Diana? Diana: Yeah. I can just let them talk to you, right? Yes, please. We want your stories. It isn’t necessarily about thriving, like I mentioned last week. It’s about the journey and we want to thrive. So it’s the journey towards thriving. So even if you’re in a really dark place, sometimes writing helps and it’s very cathartic. So sit down at your computer and send in your thyroid story at thyroidnation.com. You’ll see it. There’s a link and then you can read all the other thyroid thriver stories. There’s little pictures of everybody on that page. You’ll see it on thyroidnation.com, so check it out. Then there’s a submit form that you’ll see as well. We just have a couple minutes, but I wanted to say really quickly, there was a woman. I had posted an article, a thyroid thriver story, about one of our team members, Melissa. She had shared her thyroid thriver story and I posted it somewhere. I think it was on Google plus, and she just now saw the story, however many months later. I posted it in May, I think. She commented on it and we’ve been back and forth. She has a similar story and she was just thankful, in awe, and couldn’t believe that there was someone else like her. She related to Melissa’s story and was just so thanking me, and wanted to say, “Melissa, I have the same thing and this is great.” So that’s really what the thyroid thrivers is for. It’s to help other people and to help other people feel supported. So Melissa did that and that was just one. I’m sure there’s plenty, but that one lady, it really touched. I’ve been in contact with her. I think she’s even gonna write her thyroid thriver story, so more on that later. Diana: Yeah, right? You can always find us on Facebook, Thyroid Nation, Twitter, and Instagram. Just type it in and you’ll find us. Be sure to tune in next week live, here at Thyroid Nation Radio. We have an amazing guest. She is a thyroid thriver herself, Jen Wittman, of thyroidlovingcare.com. Yay! 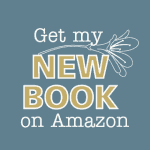 She’s an author of a great book, Healing Hashimoto’s Naturally, which you can find on Amazon. I’ll post a link for that as well. She’s wonderful. We’re going to talk health, body and nutrition. She was a chef. She’s really come into herself. She’s healing and she’s healed herself by learning, doing, and eating good foods. She wants to share some of that with us, so I’m really excited to talk to her. I don’t think we’ve actually ever spoken on the phone. We haven’t. I’ve heard her talk on interviews, but we’ve spoken on the phone. So that will be really, really great. She has a new approach that’s coming out. Diana: Yeah, she’s got a new approach that’s coming out. She’ll share that with us, how you can maybe join and get some help too. Tiffany: A very cool program. Diana: So that’s that. Yeah. It’s gonna be really, really neat. Tiffany: I think that’s it. Diana: Because shes’ got her book, her website, and she’s got a new program that’s designed to help thyroid people start to feel better. That’ll be interesting and great too. Tiffany: That new protocol is smoking. Diana: Well, this was awesome. Thank you guys for joining us. It was a great day. I really appreciate it and keep spreading the message. Hopefully, we’re helping you and we’re helping others. I’m learning a lot, so thank you very much. This is Diana, your Thyroid Nation gringatika from Costa Rica. Diana: Bringing the collective voice of thyroid thrivers worldwide so that together, united we heal.